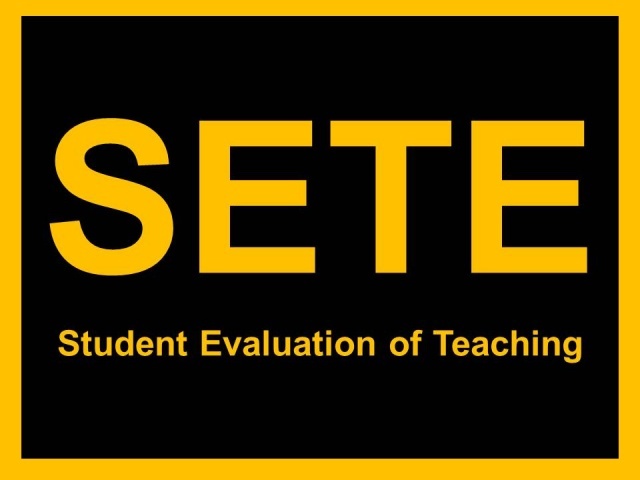 Want to achieve 100% student response rate for your SETE evaluations this spring? With the new mobile version available through SmarterSurveys, it is now easier than ever for students to access and complete their course evaluations. Students can log onto the my.unt.edu portal using any mobile device and click on the SETE icon. Similar to the 'old days' of paper and pencil adminstration, consider scheduling class time to have a colleague or graduate student administer the SETE by asking students to pull out their tablet, iPad, or smart phone. The SETE is open through May 5 and you can monitor student completion rates by logging onto my.unt.edu. For information about online versus in-class administration of student evaluations, you may want to check out this intersting article published in Student Ratings of Instruction: A Practical Approach to Designing, Operating and Reporting. As per UNT Policy 15.2.16, pre-finals week refers to the seven calendar days preceding the final week of each fall and spring semester and is designated so that students can adequately prepare for their final exams. During this week (April 29 – May 3), student organizations do not meet and activities requiring student participation such as field trips, athletic events, or performances are not scheduled unless approved in advance. Please note that no classes are held on Reading Day, May 3. Final exams should be administered at the designated times according to the published schedule. Any deviation from the schedule must be approved in advance by the appropriate academic dean. If a student has three final exams scheduled on one day, they may appeal to their academic dean to reschedule on another day during the final examination period. The deadline for applying for a 2014-2015 Faculty Development Leave (FDL) is September 30, 2013. Attend one of the FDL workshops to learn more about eligibility criteria, the review process, and expected outcomes. Experienced faculty members and review members will share what it takes to craft a successful leave proposal and experience. Register today for one of the sessions---Space is limited! Is a Fulbright in Your Future? Certainly! The Fulbright program is one of the most widely recognized and prestigious international exchange programs in the world for both students and faculty. If you are intersested in becoming a 'Fulbrighter,' we strongly encourage you to join the Mentoring Group funded by the Office for Faculty Success. This mentoring program provides individualized assitance to facuty members who are interested in preparing for the competitive application process. Deadline for the 2014-15 Fulbright Scholar Program is August 1, 2013. Contact Dr. Ted Farris (ted.farris@unt.edu) for more information about this unique program. Check out the recent article to learn how UNT's Fulbright Scholars past, present, and future are spanning the globe and bringing recognition to UNT. The date has been set and exciting activities are being planned for the 2013 Salute to Faculty Excellence week--- September 23-27. The Salute to Faculty Excellence Awards Dinner and Ceremony, sponsored by the UNT Foundation, is scheduled for Friday, September 27th at Apogee Stadium. At this showcase event, we will honor UNT's top faculty award winners, newly tenured and promoted faculty, and recently appointed Emeritus faculty.